Ropes aren’t just for Boy Scout troops or for mooring boats, they are an amazing tool for people who are looking to build lean muscle mass. Battle ropes are great for cardio and because they exercise each arm independently they help to sculpt muscle while eliminating strength imbalances. They come in a variety of different thicknesses and lengths, but the most common size that you will see is a 50 foot rope that is 1-2″ thick. Many people choose to use these ropes as part of their home exercise regimen. You can use these exercise ropes to create waves or do crossovers. Either way they provide a strenuous physical exercise that is hard to replicate using machines or free weights. Let's take a look at some of our favorite battle and exercise ropes. 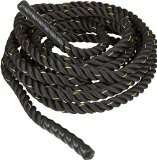 What are customers saying about battle ropes? Ropes are able to help make body parts become significantly more strong. Take hold of this rope for your training and it will not fail you. It is handcrafted and made in the US. 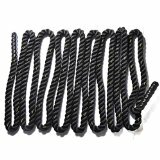 For added toughness and durability, it is designed with a 3-strand twist made of black poly material. 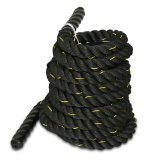 This military-grade rope is available in 1.5-inch and 2-inch thickness with the length varying from 16.5 to 50 feet. When you buy this product, it would come with a complimentary video on how it can be used to maximize your workout. 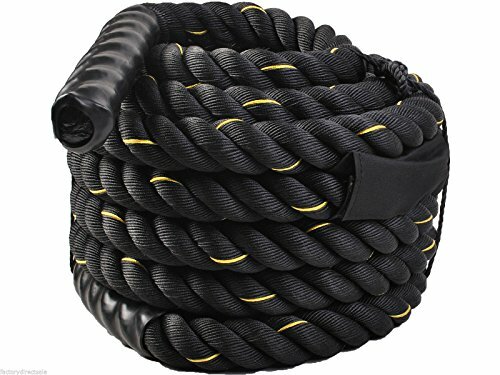 Whether it be for playing tug-of-war or doing cross-fit training or MMA, this rope will be useful to you. Dacron, a polyester fiber that is strong and wrinkle-resistant makes this product extra durable. It is also wear-resistant and comes with yellow tracking lines. It can be anchored easily to any sturdy object. With a majority of its buyers giving it positive reviews, there is little doubt that this rope is good buy. It is available in 1.5-inch thickness and 30-foot and 50-foot lengths. Several users have cautioned that it wears and tears easily on cement floor. Other than that, it is great for its price. No time to work out in a gym? Simply buy one roll of this rope and you are good to do your personal fitness at home. This rope is designed for indoor and outdoor use. It is heavy enough to provide the right amount of resistance when doing full body exercises and training. Made from Dacron polyester, it is strong, durable and wear resistant. It is available in 1.5-inch and 2-inch thickness and 30-foot, 40-foot and 50-foot lengths. It comes with yellow tracking lines and heat shrink cap on both ends. Made from 100% polypropylene and polyester, this durable and wear-resistant rope is designed to have high tensile strength. Mixed martial artists, boxers, swimmers, athletes and ordinary people trust this rope for doing their regular physical fitness training. Its 1.5-inch thickness allows users to have a good grip of the rope while performing a routine. 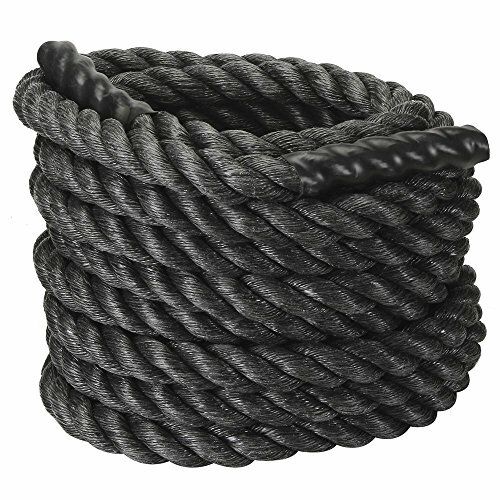 This 3-strand twisted rope is available in 30-foot, 40-foot and 50-foot lengths. It comes with an Oxford waterproof sleeve for protection from fray and friction. Both ends also have heat shrink caps and yellow tracking lines. While it looks just like any ordinary rope, this one is more than that. Made from 100% poly Dacron, it is designed to have a strong construction and be wear resistant. 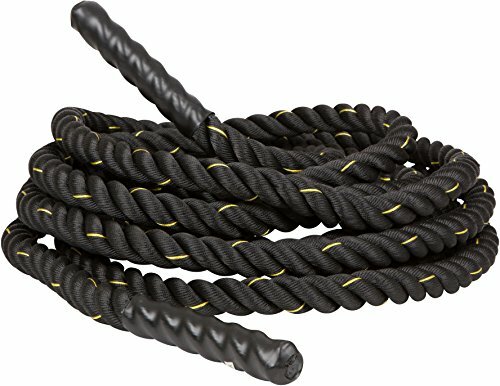 This 1.5-inch black rope provides just the right amount of resistance for strength and cardio training. It also comes with waterproof sleeves on both ends to avoid fraying, breaking or coming loose. It is popular among swimmers, athletes, martial artists, boxers and anyone who wants to try a different fitness workout. 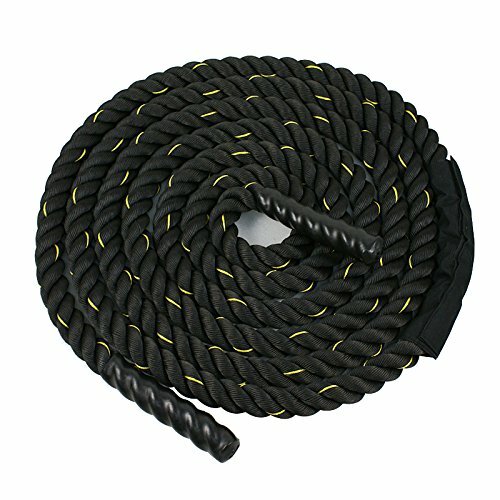 When you buy particular exercise rope, you can choose among 30-foot, 40-foot and 50-foot lengths. When exercisers can’t get to the gym, they enjoy using battle ropes in conjunction with resistance bands and kettle bells. 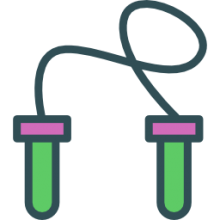 Users who have never used a battle rope before frequently note that it requires a lot more stamina and they had anticipated. However, they notice quality gains over time the more they practice with their training ropes. Most users were satisfied with a rope that was 1.5″ thick, some were surprised that one and a half inches was actually a lot thicker than what they had anticipated. Many people that purchased a battle rope went onto YouTube to watch all of the different exercises that they could do with their new exercise equipment. Ensuring that you use the battle rope with proper form is a way to maximize gains. Some users who purchased white ropes noted that they showed dirt, and the second time around they decide to purchase black ropes that didn’t show any discoloration. Perhaps the primary negative across the board for battle ropes is that they do tend to fray if they’re not used on smooth surfaces or mats. If you do purchase a battle rope, make sure you consider the surface that you are going to use it on, if you do not want to have your battle rope fray. Some of the ropes have a sleeve in the area where you loop it around the post, and this was noted as a great way to keep the rope from fraying in that area of high stress. Experienced fitness professionals who have never use these ropes before are often surprised at the burn they get especially when they use a squatting position. Battle ropes are particularly intense on the shoulders, traps, triceps, lats, biceps and forearms. Some users are using battle ropes exclusively for cardio replacing the running but they used to do. The use of ropes for exercise dates all the way back to ancient Egypt. The Egyptians used ropes for a diverse range of different things-carrying, driving, pushing, pulling, hauling. All of it intended to move vehicles, equipment and people. Ropes do not receive the sort of veneration and accolades and that they should- they are ingenious inventions that throughout history have enabled significant human progress. A man by the name of John Brookfield was an innovator who discovered the utility of ropes for exercise and physical training. Let’s take a look at some of the benefits of using ropes for exercise. Utilizing what is called a dual-force dynamic weak areas like your hips, feet, ankles, shoulders and even your mind can be significantly strengthened by battle rope exercising. As the waves you create with your battle ropes increase in their duration, speed, size as well as distance, the force throughout the rope increases which means that the physical effect of the exercise intensifies. The waves that you produce when you use the battle rope creates a chain reaction of movement that passes through the body toughening and strengthening every segment of it. Another benefit is increased stability. As you increase the intensity of these repetitive movements, your lower and upper body become stronger and more harmonized, which creates increased balance and stability. The next benefit we should mention is the increased mobility that comes from the use of battle ropes. Different mobility sequences will target different areas of the body-from your shoulders and core to your hips, knees, feet and ankles. Incrementally increasing strength in the different areas of your body will dramatically enhance your overall performance. you were going to overdo it. The exercise can only be as intense as you let it. The dual-force effect as well as the contralateral movements quickly help to adapt your body to this strenuous form of exercise. What this means is that it uses gravity itself and force created by the ways to improve your body’s physiological responses. When you train with these ropes you were able to amplify the effect into directions- utilizing gravity and the wave force. This makes this method of training especially dynamic and adaptive strategy to provide overall physical health benefits. Battle rope exercise training is a really interesting and ingenious strategy to get a intense, full-body workout. Try working out with a partner. It’s likely that you will achieve more games working with somebody that helps keep you accountable and motivated. If you structure your workouts together using an inch full rotation, when you are resting your partner can be working and vice versa. This way you can stay on top of each other and make sure that you’re both getting the best workout possible. One final tip- check out YouTube every so often to see what new methods of rope training are trending. Whereas with elliptical machines and stair climbers, you’re always doing the same boring movements, with battle ropes there are so many different things you can do and try that the training is always fresh. Users report that their entire body composition feels different-daily say that they are stronger, with more muscle definition and an increased endurance that is truly astonishing.